The Lorraine 'Fritzi' Yale Gallery displays works by a range of contemporary local artists. The 'Fritzi' Gallery is dedicated to the collaborative process and offers the public the unique experience of being able to enjoy theatre and visual arts. Located on the 2nd floor of the Irving Greenberg Theatre Centre. The Fritzi is open for visits anytime the front doors are open. You can take a stroll through the current exhibit and if you find a piece that particularly moves you, you can purchase it. All of the artwork is for sale! The Fritzi Gallery opened to the public in the fall of 2007 thanks to the generous gift made by Janet Yale, in honour of her late mother and artist, Lorraine 'Fritzi' Yale and TELUS. The Ottawa School of Art presents new works by Diploma Student Josée Van Dromme. 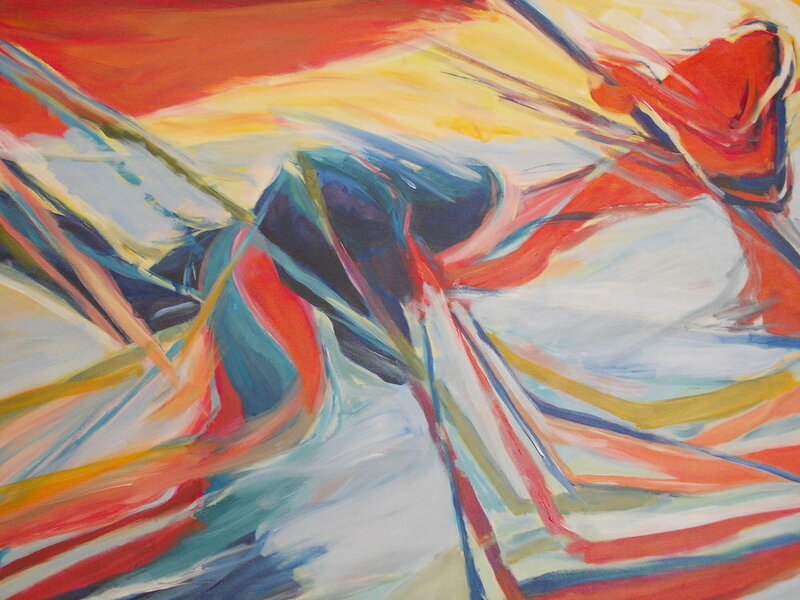 Ottawa based artist Josée Van Dromme has been involved in art and design from an early age. She holds an Interior Designer Diploma and an Architectural Technician Certificate from Algonquin College. Josée has also held teaching positions at Algonquin Collage and at the Ottawa School of Art, (summer Children and Teen’s program), where she is also completing her third and final year of the Fine Art Diploma program. Josée was the recipient of the Robert Hyndman Painting and Drawing scholarship in 2016 as well as the Lillian Raport Memorial scholarship in 2018. Josée’s new abstract paintings are textured and organic with rich layers of earth toned colours which create a sense of movement and rhythm. Her work is definitely influenced by her love of mark making and nature. Josée has exhibited her work in a number of group exhibitions associated with the Ottawa School of Art. Architectural designer, artist, and founder of Van Dromme Designs, Josée was born in Montreal and raised in Ottawa. Her love of art and design started at a young age and was refined after completing formal design and art education, working for over two decades in the design industry and teaching for the Interior Design program at Algonquin College. She currently divides her time between the worlds of design and art. Josée's art is influenced by her love of mark making and the outdoors. Tuesday April 30, 2019, 6 – 8 p.m. The Ottawa School of Art presents new works by Diploma Student Kamill Santafe. Ottawa based artist Kamill Santafe is in their third and final year of the Fine Art Diploma program at the Ottawa School of Art. In 2016 they received the Fritz Allgoewer Memorial Scholarship; as well as the David and Nicole Henderson Scholarship in 2017. In 2018 Kamill was also the recipient of the Ted Marshall Memorial Scholarship. In this latest series of largescale artworks, Kamill uses their materials boldly and deliberately. Materials are layered methodically, creating imagery that speaks to their passion for activism. The results are emotional; revealing powerful messages which relate specifically to the challenges Queer and Transgender people face across the world. Kamill has exhibited their work in Ottawa, and their work can also be found in private collections in Ottawa and Toronto. I'd like to recognize that the land in which this exhibition is held, the land where I live, work, study and worship is the traditional territory of many First Nations. These territories compromising the Kichi sibi watershed, and including all Canada's national capital region, were never surrendered or ceded by First Nation people. This is the reality inherit in the Indigenous Legal system of the First Nation, and also recognized in the Canadian common law as laid out in the Royal proclamation of 1763 and the Canadian constitution, Act 35 of 1982. As an artist, human rights advocate, and immigrant, I am committed to working through an anti-oppressive approach when engaging with communities. I recognize that I am not innocent in the act of colonization, and by merely residing on the lands I am actively in the existence of the settler state. Therefore, I strive to make this acknowledgement a reality in solidarity with the Indigenous people of Canada not only in my words but with my deeds to keep building on Indigenous children and youth strength. By acknowledging their rights and empowering them to make their distinct contribution to their communities, Nations and the Canadian social capital. So, they can also enjoy growing up healthy, happy, and safe. Human rights activist. Visual artist. Trans. latinx. Student. Muslim. Mental health advocate. Soccer player. Colour blind achromatic. I immigrated to Canada in 2010. Arriving in a new country and unfamiliar with the language I centered my attention to becoming acquainted with this new culture and have embraced Canada with passion. My firm commitment and enthusiasm for learning have supported me to engage in a variety of settings and expand my knowledge, and skills. I have decided to enroll myself in the Ottawa School of Art with the goal of learning essential art techniques and methodologies. The curses and teachings I have obtained have allowed me to identify and comprehend my style. From various art styles and genres such as drawing, visual foundations, colour theory and studio painting, photography, sculpture, and my artistic journey I have found myself to be an activist artist. My works of art are vessels that carry emotions and responses to questions once asked in life. My works of art are for all the souls who have been lost. I have been there as well. My works of art are for all the sparkly eyes that have been trying to stay radiant onto those eyes despite the worst of the times because I too know how that feels. My works of art are to remind others hopefully one day all the world, that resiliency is the most potent brush you can paint with and change the world. This exhibition is dedicated to all Trans and Queer people in the world who are silenced, were silenced, and keep on dying in silence. My primary interest is to make an inquiry through art about various aspects of visual, spatial and temporal perception with beads, acrylics, glitter and pastels while exploring concepts such as geometry, perspective, symmetry, and representations. Integrating them to my political statement and research specific to the challenges Queer and Trans people face across the world. For this, I use different artistic techniques such as drawing, photography, painting, collage, and installation; integrating and creating a relationship between materiality, support and technique with the represented image. Part of my methods were to identify the best and most efficient way to work with my materials, from needles and thread to glue gun and silicone sticks, throughout each of these paintings I was able to develop a keener sense of creation whether it was with the mixing of paint, the unique brush strokes or the beading process. In other words, I fragmented the paint and mix them with others, either to incorporate the political statement into the representation or to unite them with the rest of the paintings and alter their meaning.